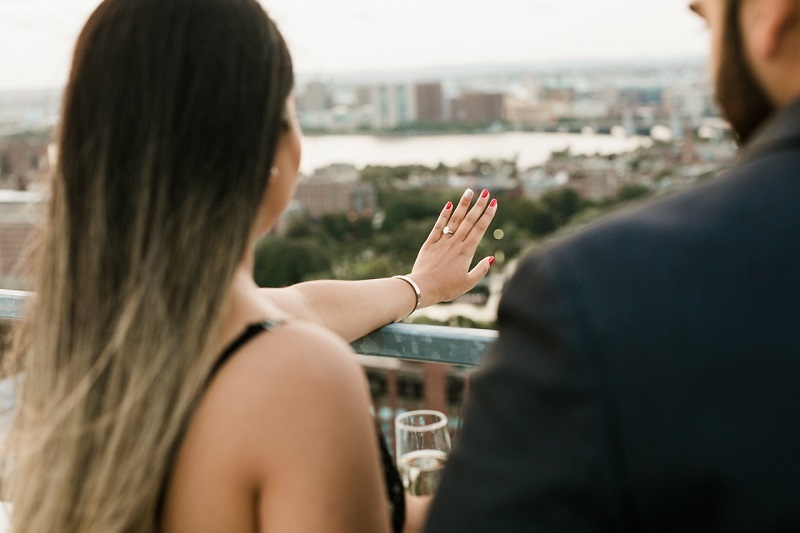 Posts » Vrunda & Sunny’s Romantic Rooftop Proposal in Boston! 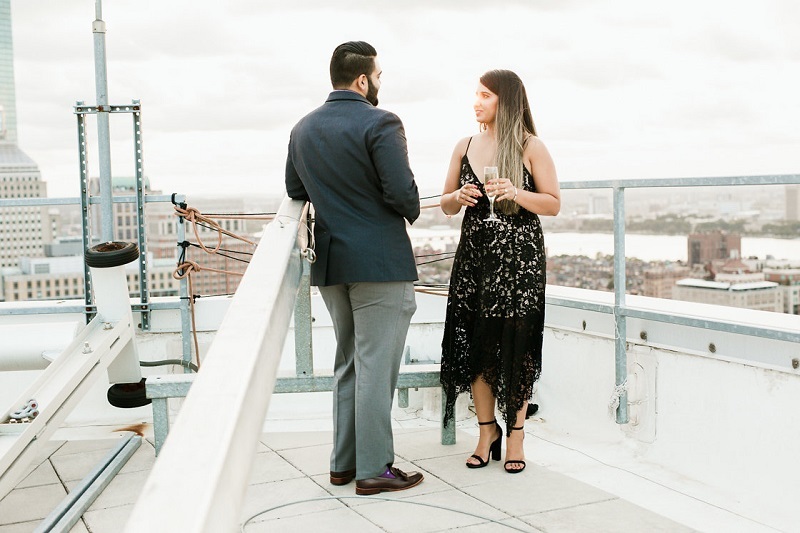 Vrunda & Sunny’s Romantic Rooftop Proposal in Boston! Vrunda and Sunny are from same town Lowell, MA(USA) but never met or ran into each other before their mutual friend played a huge part!! Vrunda works in research and Sunny in Software. Their official engagement ceremony will take place in Radisson, Chelmsford on Sep 22,2018. Images courtesy Lensy Michelle. 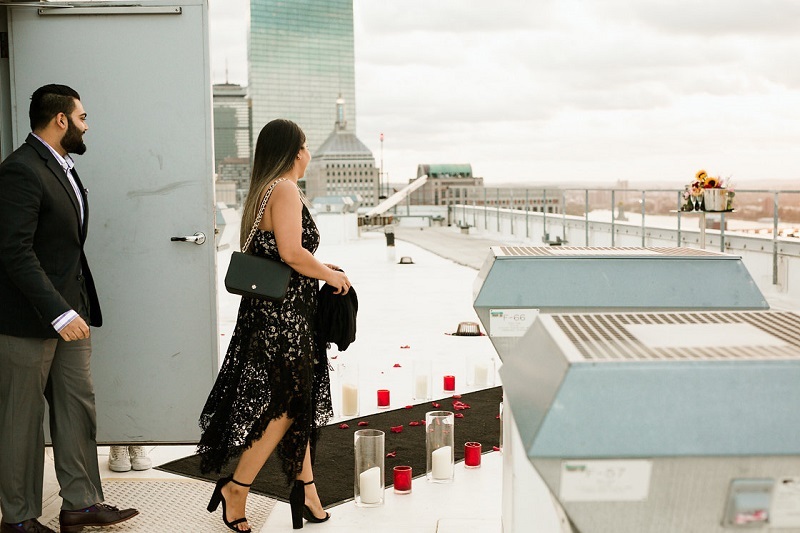 Wedding date is July 28,2019 in Boston, MA. 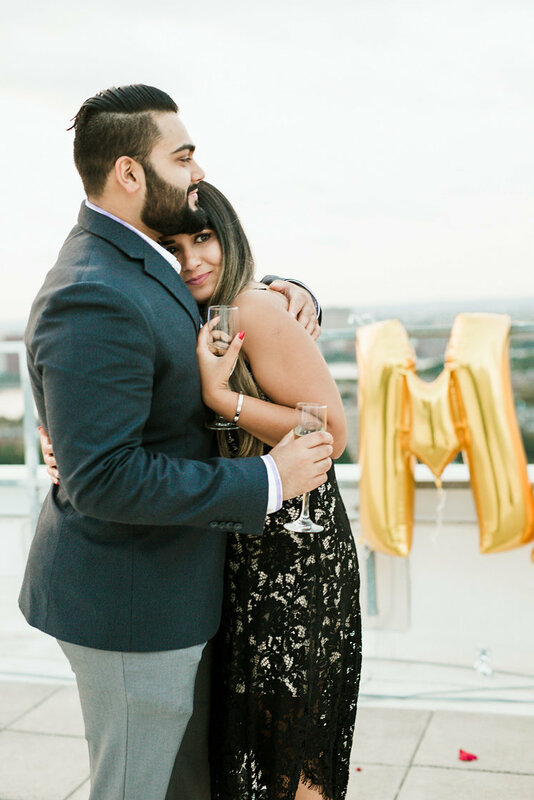 Their story began in December 13, 2014 at Tina Desai’s (a mutual friend) engagement ceremony. Sunny’s mom spotted Vrunda and was blown away by her beauty. Little did she know she was sitting right next to Vrunda’s mom. As conversation started flowing, both moms tried to play matchmakers and set up Vrunda and Sunny. But they failed! A year went by and Tina got married. One day, Tina and her family visited Sunny’s parents. Tina decided to become a REAL matchmaker and convinced Sunny to pursue Vrunda. 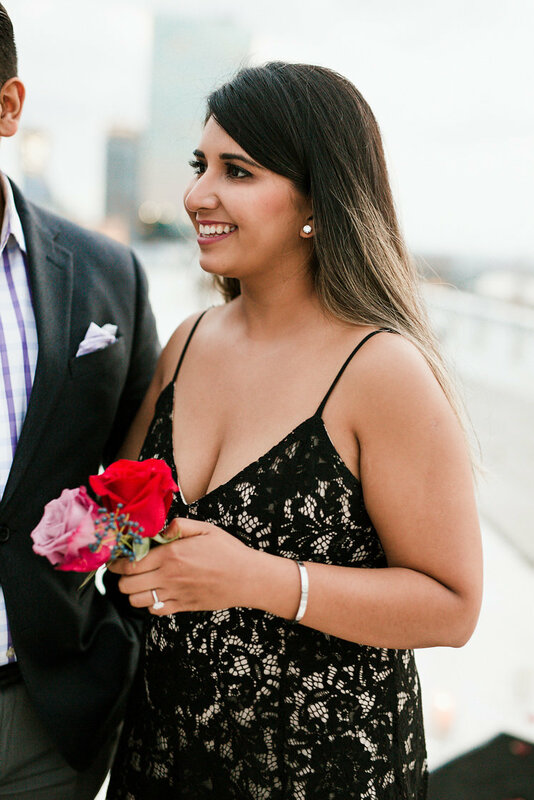 On September 27, 2015 Sunny messaged Vrunda on Facebook asking her to go on a date with him. On October 5,2015 they went to Vrunda’s favourite spot MARGARITAS. Over tacos and strawberry margaritas, they got to know each other. Vrunda loved his passion for work, hobbies, values and his shy personality. Sunny loved Vrunda’s pickiness and outgoing and extrovert personality. But like they say OPPOSITES ATTRACT and that was true in Vrunda and Sunny’s case! 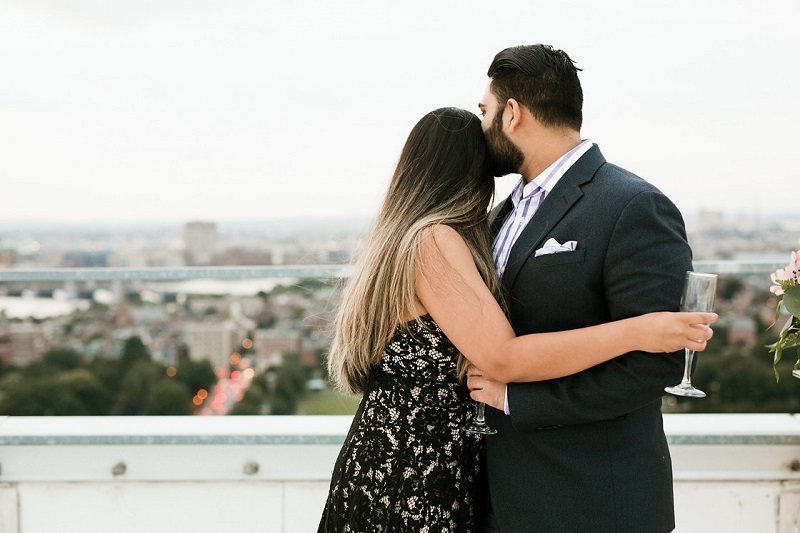 After months of pasta, paneer tikka and enchiladas, Vrunda was waiting on Sunny to make it official. On the other hand, Sunny was afraid to ask, thinking “What if she doesn’t want to be my girlfriend? What if she doesn’t like me? ” Vrunda took the matter into her own hands and decided to make it official under the moon. It was the beginning of Happily of Ever After ! 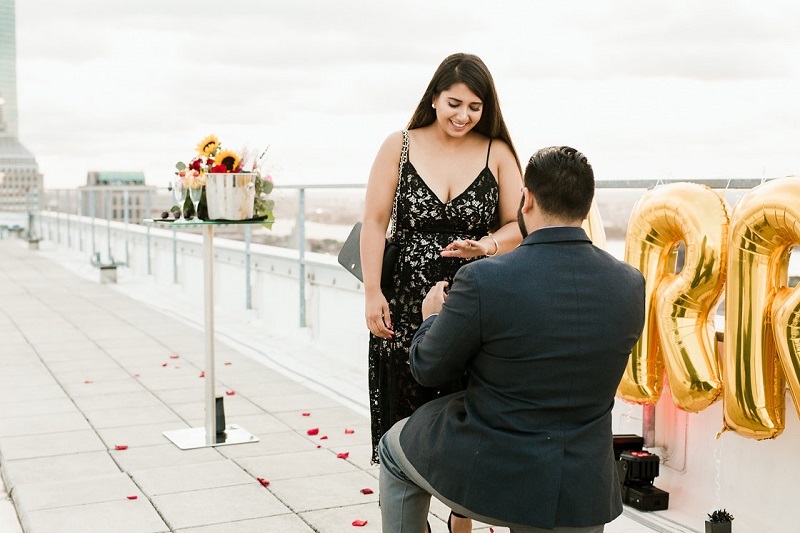 Vrunda always dropped hints for the kind of proposal she wanted and that included a PHOTOGRAPHER along with PRIVACY. Weekend before it went down, Sunny told Vrunda about his plans for the coming weekend (August 19, 2018). 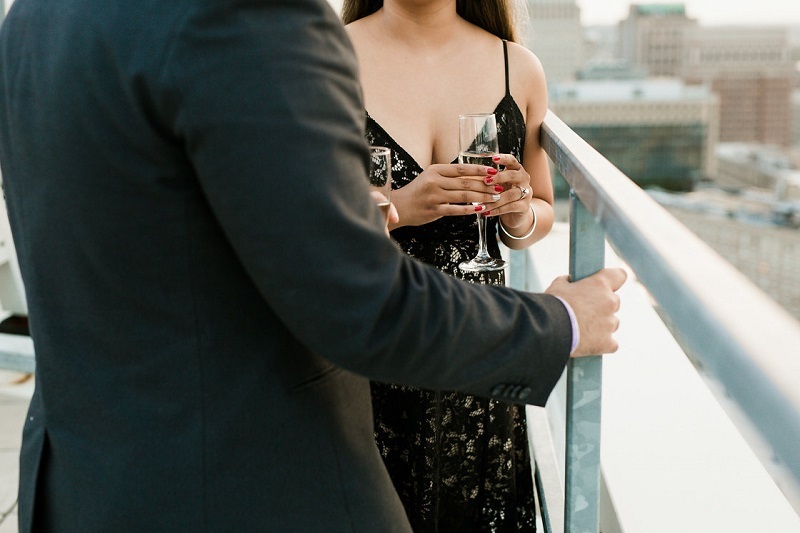 Vrunda loves wine (she’s crazy for CABERNET SAUVIGNON) so Sunny thought “why not create a fake Wine tasting event at W.Boston?” He talked highly about how great and fancy this event is while dropping hints to dress up like FANCY to Vrunda. 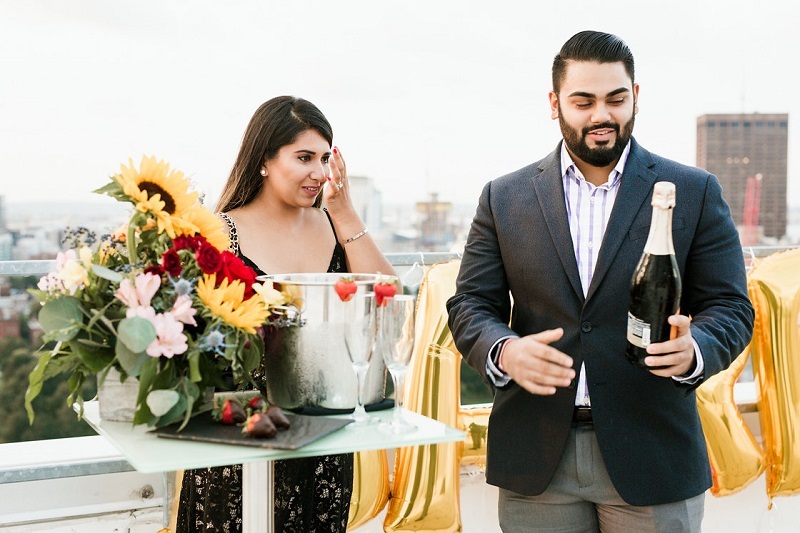 The week of the Proposal Sunny told Vrunda about his upcoming trip in City(Boston) for work, Vrunda had no idea it was a trip to W Hotel for finalizing details and creating a Fake Wine Tasting Event poster which he later shared with Vrunda. Few emails back and forth after the meeting with W Boston staff it was time for the show!!! After arriving at W earlier than planned time Sunny knew he had some time to kill, so why not grab a drink at the Hotel bar? 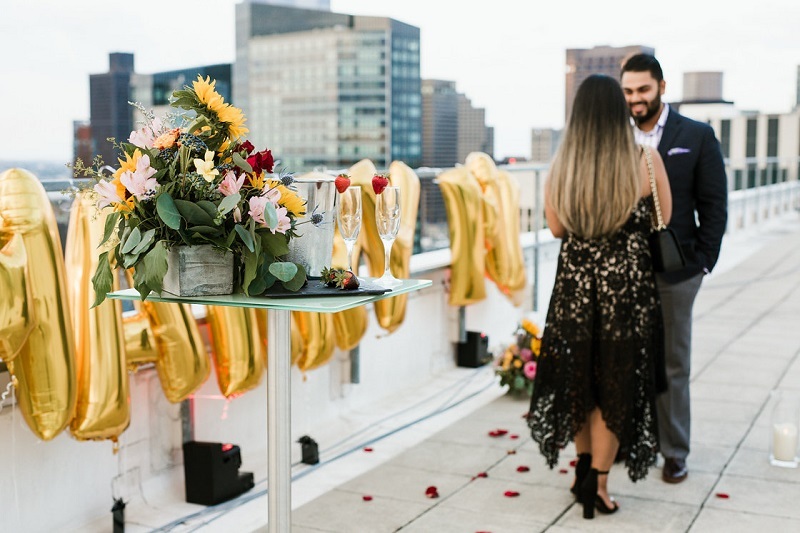 At 7 pm, the hotel coordinator Paige (who helped Sunny with perfect execution of the proposal) escorted Vrunda and Sunny to the top floor cause “apparently” it involved changing a few elevators. 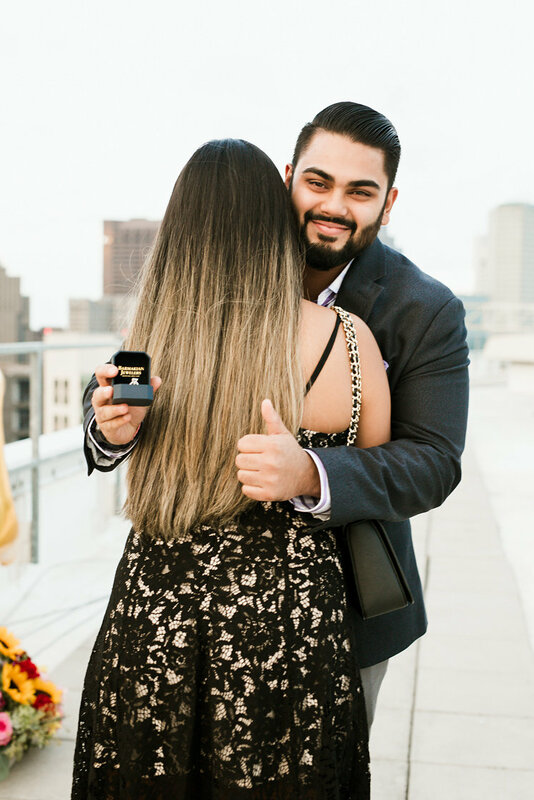 Vrunda had no idea her life was about to change and that she would be getting engaged to the Love of her Life!! 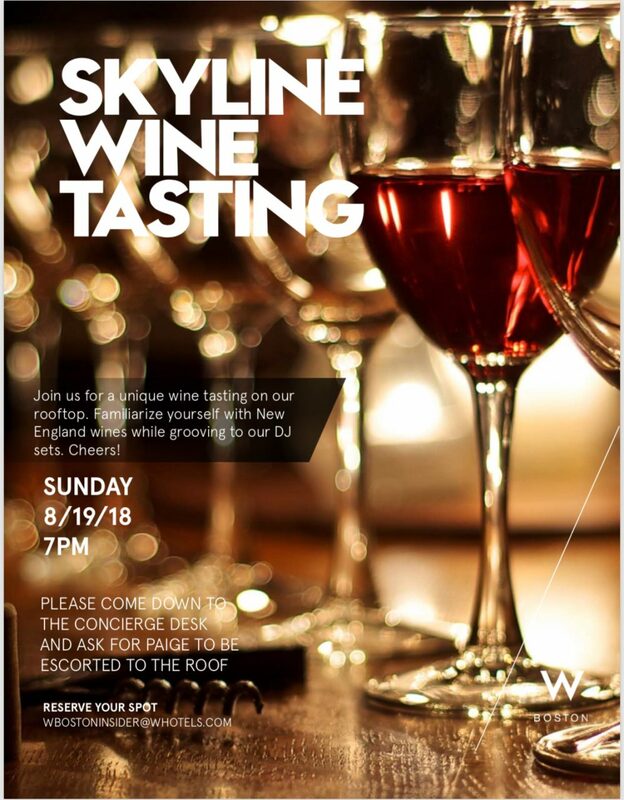 Vrunda spotted the same ‘fake wine tasting event poster’ near the staircase and hall way, leaving no clues until she reached the top floor where the doors opened and TA-DAA there was a photographer ready to capture the special moment! Sunny asked Vrunda to make him the luckiest guy on this planet by Marrying him!! 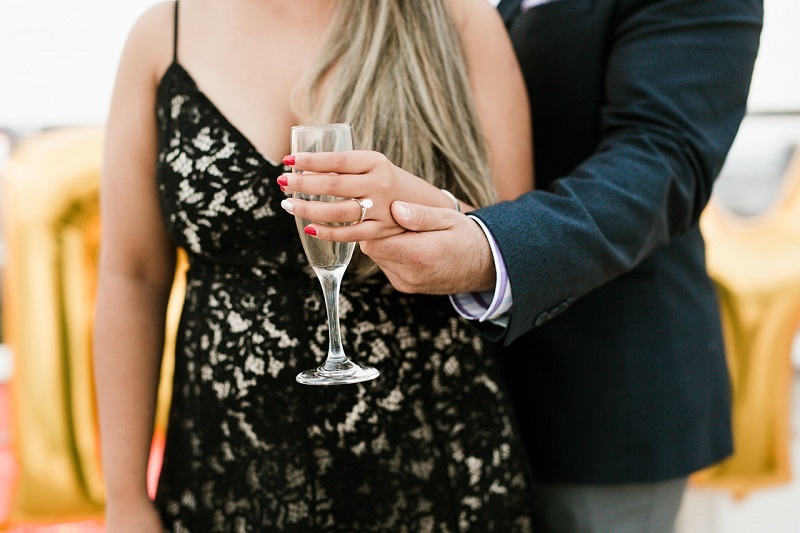 After shedding a few tears of disbelief Vrunda said YESSSS……Sunny went above and beyond to plan this special moment. Special thanks to W hotel staff for making sure everything is PERFECT!! 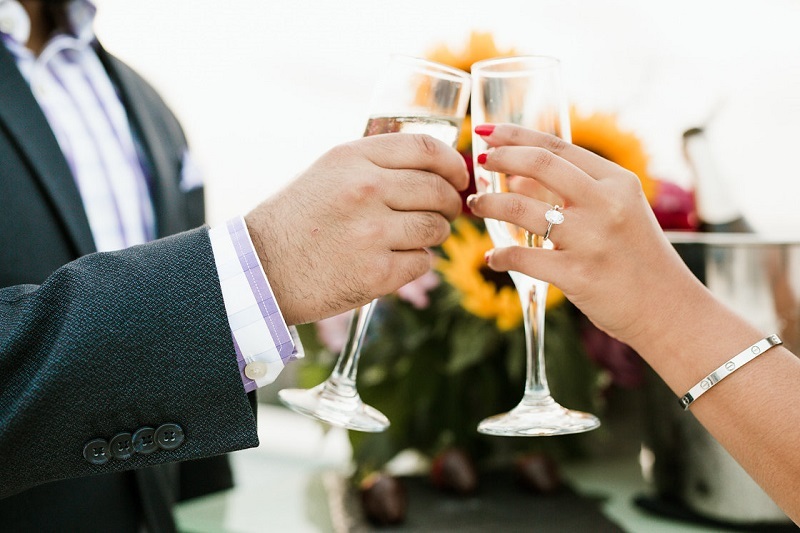 Congratulations to the beautiful couple! We wish them a very happy life ahead! Want to submit your professionally shot pre-wedding/wedding/engagement/honeymoon pictures/videos to us for publication? Simply email us the details at dipa@weddingsonline.in! Get details here.